On the day, you can write with pencils and paper, or use your device. Either way, we want to know what you wrote! Login and post your pieces on youngwritersproject.org. All of the prompts will be posted as Challenges on the front page of the site, and are also linked at the bottom of this post. Pick the Challenge that sparks your imagination, click the WRITE button beneath it and fill out the information. Before saving, put the hashtag #vtwrites18 in the body of your post. If you took Vermont Writes Day photos, you can upload those to our site, too! Click WRITE > Create a Blog Post in the menu bar. Then click Add Media and choose Advanced Upload in the images section. Before saving, put the #vtwrites18 hashtag in the body of your post. Visit vermontwritesday.org. It will be open for one day only on February 15 and no login will be needed in order to post. Each prompt will clearly be highlighted in the top menu bar. Click the name of the prompt that interests you to read it and see what others have written in response. When you are ready to post, click WRITE in the top menu bar and fill out the form. You may post on behalf of your students on both sites. No advance registration required. On February 15, those submitting student work via vermontwritesday.org should sign our Guest Book. The Guest Book will give us an idea of which schools and teachers participated in Vermont Writes Day via the special site. 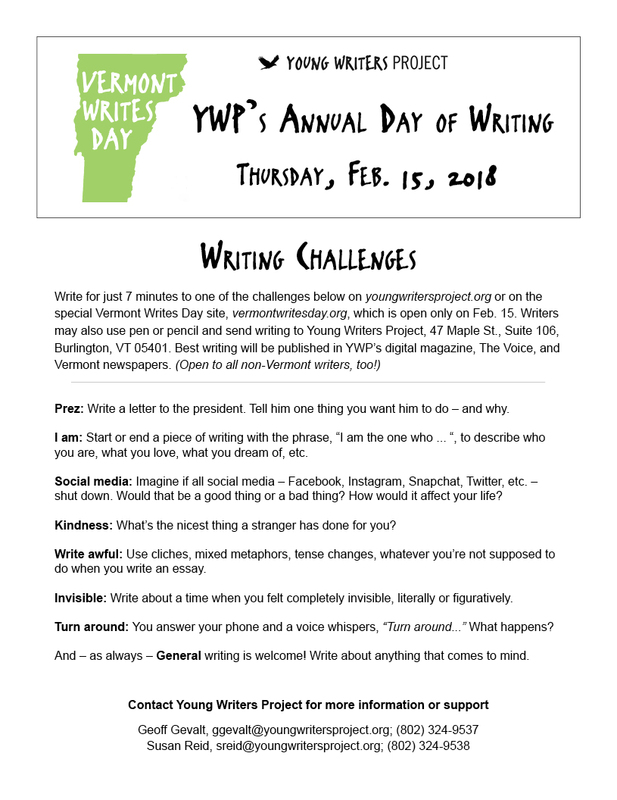 If you took photos during your Vermont Writes Day festivities, you can share them with Young Writers Project when you fill out the Guest Book. A link to the Guest Book will be in the front page post on vermontwritesday.org and also in the right sidebar under the INFORMATION headline. Those submitting via their youngwritersproject.org accounts need not notify YWP of participation; your account information tells us who you are and where you teach. If you wish to upload photos or a write-up about how your school/class celebrated, go to WRITE > Create a Blog Post and type away! Remember to put the #vtwrites18 hashtag somewhere in the body of your post before saving.